I left off in part 1 of this series asking why it’s easier to connect with some digital characters more than others. One aspect of the answer to this question is believability. Some people would equate believability with realism, but I would argue that the two are very different. So what exactly is the difference between things that are believable and things that are realistic? The obvious humor here is that this is not easy to do. 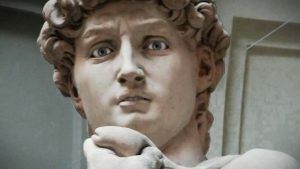 In fact, since the style of Michelangelo’s David is so realistic that if we were to change just one detail so that the sculpture did not “look like David” it’s likely that we would ruin the piece. 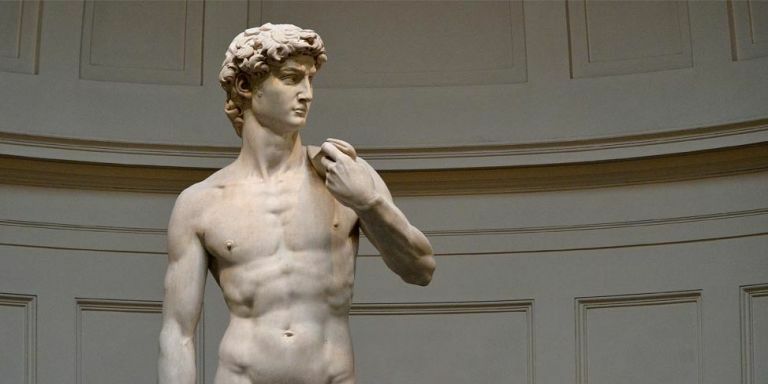 However, let’s think about the primitive constructs behind this statue of David. The story of David and Goliath is only a few paragraphs long and it can be easily retold in numerous ways without losing its meaning. This holds true because when we believe in the character and the premise is strong, we fill in the rest of the details ourselves. So how does this all translate to digital characters? When I am technical-directing an experience that uses digital characters, I think of the minimum level of detail necessary for the user to believe in the characters and to establish an emotional connection to the experience. 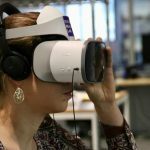 As an example, here is an experience that I documented from our Chalktalk VR project where Ken Perlin is interacting with this procedurally animated dinosaur. Ken is able to interact with the dinosaur, and the dinosaur responds accordingly, but what else can we notice about this simple dinosaur?